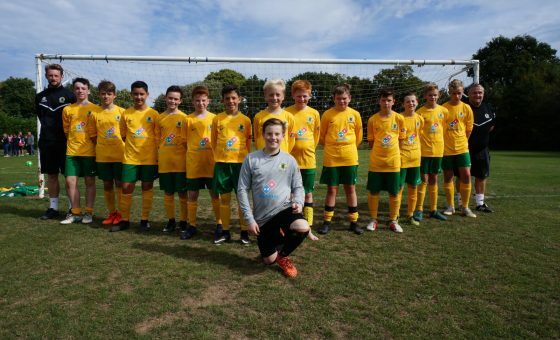 Having sealed the league title last week against Bognor Regis to complete a league and cup double, the young Hornets had the opportunity today to finish the season unbeaten in both the league and the cup if they were to avoid defeat against today’s visitors, Worthing Town Blue. 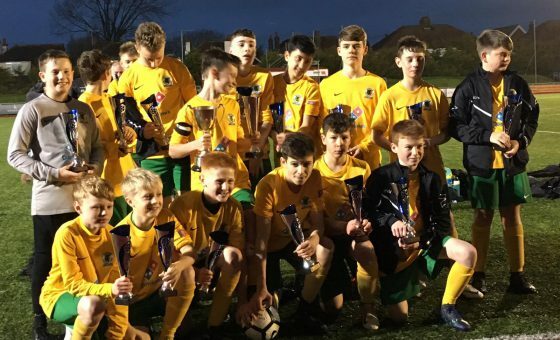 In a lovely gesture, the boys were applauded on to the pitch by their supporters and their opponents, who provided a guard of honour to congratulate them on the double. 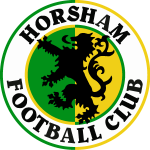 Horsham started the game very positively with several passages of play that resulted in no less than four corners in the first five to ten minutes and some excellent goalkeeping from the opposition ‘keeper that was keeping us at bay. It was from a set-piece that our breakthrough came when an in-swinging corner saw a shot on goal saved once again by their keeper, however he could not keep hold of the ball and Nathan Jones was on hand to tap in the rebound. It only took two minutes from the restart for the boys to go 2-0 up. A ball was played through to Jasper Butterfill who put the keeper under pressure and when he was only able to clear it to George Bowler, he played the ball out wide on the left to Frankie Mills who used his strength to drive on towards the goal and calmly place the ball across the ‘keeper and into the bottom right corner. Having taken the lead with two goals in quick succession the Hornets struggled to get hold of the game for the next ten minutes, during a period of pressure from the opposition. But some excellent positional play from our keeper Monty Watson-Price, some very hard work in midfield from Stan Berry and George Bowler and some strong defending from the back four meant that we were able to get through this stage of the game. With five minutes of the half remaining the Hornets made it 3-0 and could’ve made it 4-0 if it wasn’t for their outstanding goalkeeper. Once again set-plays played a part in our third goal when an in-swinging corner was not cleared by Worthing Town Blue after three attempts, so Frankie Mills stepped in to tap home from close range. Immediately from the restart we won possession and a great passage of play saw a ball played wide to Frankie who was causing trouble down the left and his first-time cross saw Jasper Butterfill connect first time only for the goalkeeper to make a point blank save. The second half did not see the young Hornets play the football we know they can. Worthing started to get a hold of the game and we struggled to get the ball down and to play the short passing game that we know we can. However, Worthing were unable to break down our defence and after fifteen minutes of the half gone, we scored our fourth. Jasper Butterfill dropped deep to hold the ball up and lay it off to his strike partner Nathan Jones out on the right wing. A perfectly weighted ball from Nathan up the line to Stan Berry who picked out Luke Harrison with a lovely cut back cross and Luke finished convincingly. The remainder of the game was very scrappy, with Horsham struggling to keep possession of the ball and as a result put themselves under a lot of pressure. This allowed Worthing to get a consolation goal from Fergal Takaza as he was played through our defence and finished very smartly in the top corner. A slight change in formation and tactics did allow Horsham to prevent any more goals being conceded and enable them to take control of the game and see out a 4-1 win to finish the season unbeaten! 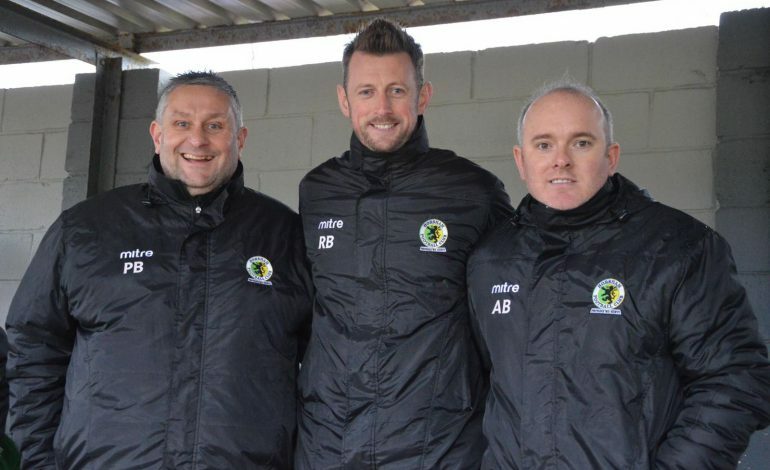 As the season comes to a close today, manager Paul Brown and his coaches Ross Butterfill and Alex Bethall (pictured) would like to thank the squad and their parents for what has been an incredible season.